Over the years GIS has grown to cover a very broad horizon. It’s no longer the domain of specialized departments; instead it has become deeply woven into an organization’s fabric and extends to a very public and connected audience. The fact that we think differently today than in the past about how we use–and perhaps more importantly how we can use–GIS reminds us that we need to continue to evolve our skills in new directions, whether we’re seasoned GIS veterans, or simply trying to land that first job. A recent e-mail from someone just beginning to to take their first steps into the GIS job market had me thinking about this again. They asked me whether they should take a course in Python to improve their GIS job prospects. “Sure, that would definitely be a good idea,” I said. But at the same time I realized that when I meet with GIS organizations, the things they seem to wrestle with are beyond the usually anticipated skills of data conversion and management, modelling, metadata, and Python prowess. Even cartography has to be considered in a different light in the web mapping world of mashups, slippy maps, and fast and furious app development. In what areas do users feel challenged, or tell me they’re seeking additional talent? The answers are easy when you consider how GIS has moved online towards transparency and self-service mapping, great browser apps, and into a device-centric world on your phone or tablet. Clearly this is a case where the technology of the day dictates the habits and expectations of consumers of geographic information, and also the corresponding requirements for today’s GIS professional. Here’s what I’ve come to understand are sought-after skills. Even the best functionality or information can’t be appreciated or effectively used behind a poorly designed website or app. The user experience (UX), and design of compelling apps and websites, is a key factor in reaching a target audience, and how that audience perceives the information presented. It doesn’t matter whether it be a long-time resident in a city trying to find the office to pay a late bill, or a community activist looking to push the envelope by hacking with data the city’s GIS has provided. What you deliver must be compelling and friendly. Lots of GIS organizations are challenged with a lack of design and UX talent. Any app these days must work on a variety of form factors, from full-screen browser to tablets to smart phones. If you can build responsively designed apps that magically morph to fit all needs and form factors, you’ve got some valuable skills. Remember when you published a GIS service with 20 layers and 50 sublayers? In the world of mashups this is more than a speed bump, it’s a roadblock. Understanding the tradecraft involved in delivering building-block layers for authoring web maps begs for a different approach. And Web cartography sometimes requires different considerations and thinking than the cartographic design principles applied to that National Geographic-quality map you’ve hung on your wall. A successful GIS does not live alone, but integrates with a variety of other systems in an organization. These can be business systems, enterprise tools, or real-time feeds. Experience in bridging these systems into GIS and integrating the work of other departments with skills in Sharepoint, Cognos, or other enterprise software and systems are increasingly valuable. As the ArcGIS platform moves to the cloud, there are lots of things to know about establishing and curating a successful GIS online. The new pattern of a cloud-based GIS means different ways to do things, and a new set of best practices. Many educational institutions are moving forward with specific courses and learning opportunities in these areas that can bring value to you and your resume. Clearly, GIS and how we use and think about it has transformed. 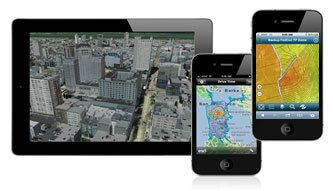 The age of ubiquitous geographic information and geo-enabled apps is upon us, and moving fast. With a few additional skills you can evolve your role in your organization, or land that first job and hit the ground running. GIS has transformed, and you should be sure you’ve transformed along with it.